Guess what? Pasta got a makeover and it’s ridiculously delicious. Oh, and there’s no meat, cheese, or noodles. I was inspired to make this recipe by my love for pasta (obviously). I have a Boozy Red Wine Spaghetti recipe in our 31 Meals eCookbook, and I also have a tempeh meatball recipe that you all love! I was originally going to combine the two. However, I decided to switch things up and use my favorite plant-based protein of late – chickpeas! These little guys know no bounds. This bolognese is simple, requiring just 10 ingredients and 40 minutes to prepare! 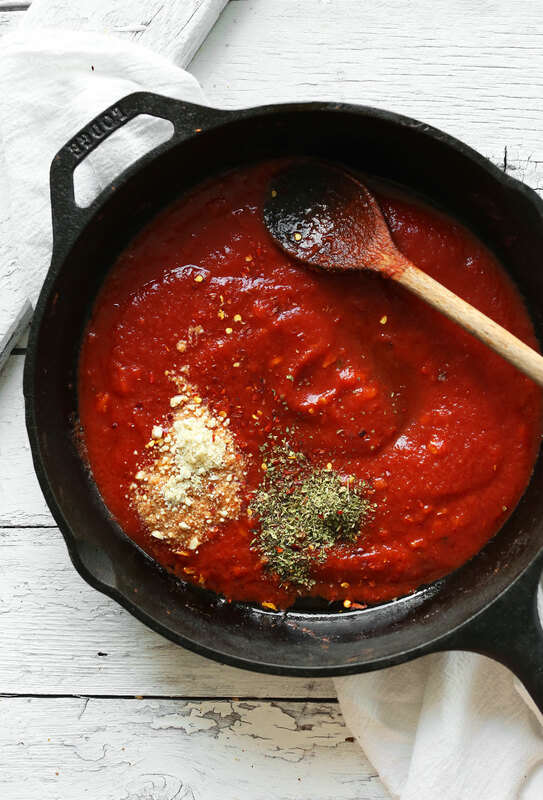 While the chickpeas are roasting, prepare your sauce and (1-ingredient!) carrot noodles. This meal doesn’t get much easier. Keep this bolognese on hand for easy, weeknight meals when the family wants pasta but you want something light and healthy, yet hearty. It’s the perfect compromise. If you try this dish, let us know! Leave a comment, rate it (once you’ve tried it), and don’t forget to take a picture and tag it #minimalistbaker on Instagram! We love seeing what you come up with. Cheers, friends! 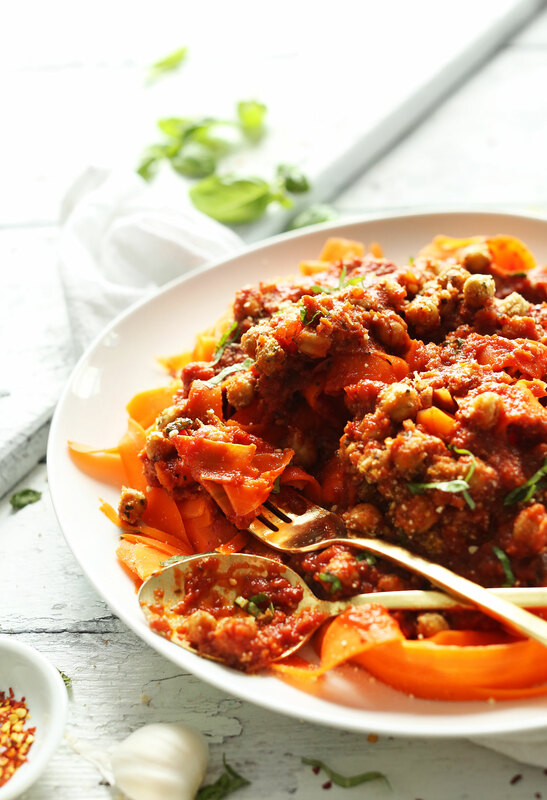 Easy, flavorful, 10-ingredient chickpea bolognese over carrot noodles! A healthy, fast, satisfying plant-based meal! 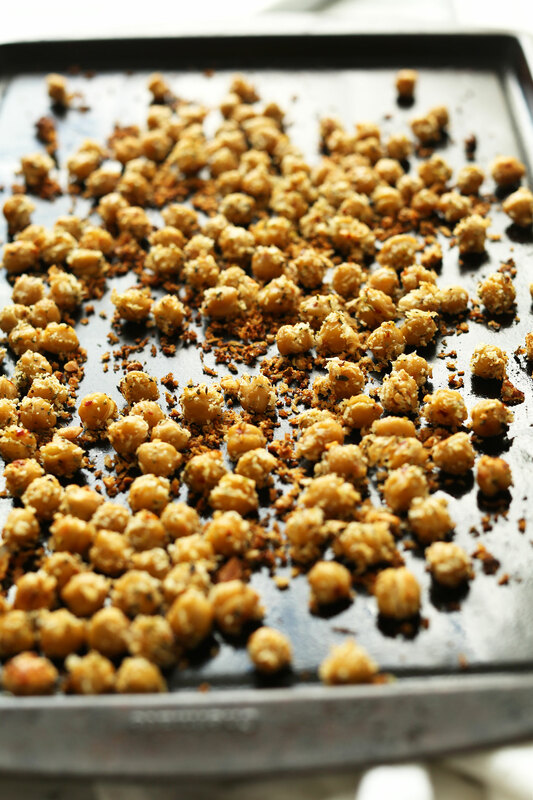 Place chickpeas on a baking sheet and arrange in a single layer. Bake for 20-25 minutes or until crispy and light golden brown (see photo), then remove and set aside. Sample sauce and adjust seasonings as needed. Add sweetener of choice at this time if preferred (I went with 1 Tbsp coconut sugar, 1 Tbsp organic cane sugar // amount as original recipe is written // adjust if altering batch size). Add 3/4 of the baked chickpeas to the sauce (see photo) and stir. 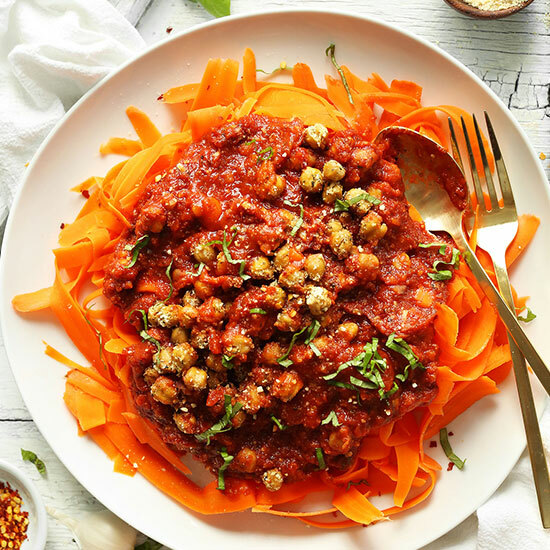 To serve, top carrot noodles with sauce, remaining chickpeas, and any additional toppings (see options above). Leftovers keep well (separate) in the refrigerator for 3-4 days. Reheat sauce in the microwave or saucepan. Add a little water to thin if too thick. *Recipe inspired by/loosely adapted from Emeril Lagasse. *Nutrition information is a rough estimate calculated with carrot noodles and no additional toppings (calculated without any additional sweetener). What i normally do when it gets to 4.30pm is gaze hopelessly into my pantry/fridge and google the ingredients i have in the hope something yummy pops up to inspire me. The number of times that the recipe i find turns out to be yours. I should skip the google search and just search your site! So here i am making anotherof your delicious recipes. Who knew a sad tin of chickpeas and some old carrots could be so good! Thank you again for helping feed my kids good stuff!! Hi Darryl! You may be interested in these high protein meals! Happy cooking! Meat eater husband loved it! It was SO good! I did add in some angel hair pasta for the meat eater and also carb lover husband, but he was super into the carrot noodles so I think I’ve hooked him! L I T E R A L L Y the best meal I’ve had in a long time. The chickpeas really make this dish. The flavor and crunchiness of them are amazing, I would make them alone for a snack. I didn’t have oregano so I left that out of the chickpea seasoning and added extra basil in the sauce in replace of it. I did not add any sweetner in the sauce but a few extra dashes of salt and parm cheese. Topped with basil and red pepper flakes. I will def make this many times over! I haven’t made this recipe yet but I will try it. My mother has been making Chicken Pea Bolognese for years, I had it many times growing up in a large Italian family. It was cheap and flavorful. Her version was very simple: chopped onion and garlic sauteed in olive oil, add tomato sauce, chick peas and simmer for 10 minutes; serve over pasta, add chopped basil at the end. Molto Bene! I felt this recipe was quick, easy, and most items were already in my pantry. I didn’t have breadcrumbs so I added some nutritional yeast as another commenter did. I also put the chickpeas in the food processor to avoid texture issues for my toddler. I used wheat noodles cut finely (for my toddler). It was a success overall. Will play with seasonings a bit more next time ? This has become a staple in our house. I make it as is (but sometimes leave out the vegan parm if I don’t have it on hand) and it is perfect. I use pasta instead of carrot noodles. Such a wonderful meal. Thank you for another winner Dana! I made this using tomato passata with a little water, salt and pepper instead of tomato sauce. Simmered it for about 12 minutes and served over wholewheat pasta. A-ma-zing!! sooooooooooooooooooooooooooooooooooooooooooooooooooooooooooooooooooo good! I came across this recipe while looking for a way of consuming insane quantities of carrots I at in my fridge and now I’m slightly addicted to it! will go get more carrots soon just to make more of this delicious meal! This has become a staple in my dinner rotations, simple and delicious! I usually add some broccoli or another green veggie to it yum! This was so great the whole family enjoyed it! Made a couple tweaks on chickpeas I added salt free lemon pepper and a little extra nutritional yeast since I didn’t have bread crumbs. Sauce I added onions and mushrooms, I never thought canned tomato sauce could taste so good! Pasta I did half zucchini noodles and half brown rice. Love all your recipes and when the husband, 1 and 3 yr olds all lick their plates I know it’s a win! Thank you!! Overall this is a very good recipe; however, 10 carrots? I find that one carrot per serving is more than enough. In fact some people may find that 1 shredded carrot is enough for 2 people. Also, this recipe calls for 1 Tbsp of oregano. That is too much, it overpowers the sauce, 1 tsp is sufficient and I would add 1/2 to 1 tsp or dried basil. I usually like chickpeas but sometimes I find them boring. But in this recipe I loved them! HANDS DOWN TO THE BEST VEGAN RECIPE I HAVE EVER MADE! This is beyond heavenly scrumptious! !’ I have never left a comment on any of the hundreds of vegan recipes I have made before because, you know. This chickpea bolognese was mind-blowing! Thank you, Dana. Thank you for bringing health, amazing flavors, and heartiness together! I am so grateful to you!!!!! Has anyone tried to make this as a meal prep meal (5 batches for lunches or dinners M-F)? If so does it reheat well and how many carrots did you use? Super delicious and easy to make! I added some paprika and hot chilli powder too to give it a kick! Delicious! Even my carnivorous hubby loved it! So gorgeous, the chickpeas taste amazing with the oregano! I made this exactly as written (except I used pasta instead of carrot noodles) and it was just perfect! I loved the coating on the chickpeas and the sauce had such a great flavor. Thank you for another delicious meal! I made this chickpea Bolognese with spaghetti squash as you recommended in another post. It was beyond scrumptious! thank you!! This was dinner tonight and it was absolutely delicious – and easy! We served the sauce on spiralized raw zucchini (we were out of carrots) and it worked perfectly. For kids who might not go for the chic peas, we mashed them (the chic peas, not the kids!) into the sauce for our little guy, and all was well in his world. Another MB success! Delicious! I added an onion, shredded the carrot in the sauce, used canned chopped tomatoes, and put it on rice pasta. It was hearty, warm and satisfying. Mmmmmm! It was sooooooo good! Thank you!!! This is the first recipe from this website that I’ve made and it was AWESOME! My carrot hating hubby had seconds!! Our toddler couldn’t get enough, either. I can’t wait to use the sauce with other bases, as well. Thank you, Dana! This was so yummy!!! I used zucchini instead of carrot and used roasted spaghetti squash. The flavor were perfect and it was a good hearty meal. I will definitely make this again. Just made this for the first time tonight, we got home late from a long night of training and this came together so quickly! I needed to double the recipe so it would last us a couple days but didn’t have enough sauce so I roasted a bunch of cherry tomatoes until they blistered and mashed them and the roasted chickpeas with a potato masher in the sauce pot. Sauteed garlic and carrots in water instead of oil for the sauce and used almond meal instead of breadcrumbs on the chickpeas. Added steamed kale and fresh basil. Gluten free/oil free/—ALL THE THINGS FREE BUT SOOOOOOOOO GOOD! I love all of your recipes that I’ve tried so far. Thank you so much- your palette is perfection. I may be a bit late to the party but I just HAD to leave a comment – this recipe was delicious! I was a little skeptical at first because I was craving pasta and as much as I love carrots, thought they could never fool me when used like this but wow was I wrong. I added sweetcorn to mine and it came out beautifully. I can only applaud your creativity! Just had it for dinner… Quote from carnivore husband “I am a fan.” I did add some onion mushroom and a touch of red wine to the sauce, I also recommend salting the noodles slightly before applying sauce. All in all really delicious and gorgeous presentation. Thanks for the idea! Made this because I just had to try those carrot noodles. They were awesome!!! The chickpeas and sauce were awesome!!! Amazing recipe. DEFINITELY making this over and over. I’m so glad I tried the carrot noodles instead of using pasta! I haven’t followed step by step, got the inspiration, but the idea of carrots as noodles swept me of my feet! They DO taste great and I feel like I can indulge this dish without my consciousness reminding me “you are eating pasta AGAIN”. Thanks a lot! step 4 is confusing: While chickpeas are baking, heat a large metal or cast iron skillet over medium heat. Once hot, add olive oil, garlic and carrots. Sauté for 3 minutes, stirring frequently. do you cook the carrots first before putting them in the pot to boil??? Nope! Those carrots are for the sauce. The carrot NOODLES are separate and are only cooked in the boiling water. Hope that helps! oooh oooh oooh. I am almost literally bouncing up and down with eagerness to make this recipe! Thanks for this great idea; we bought a 25 lb bag of chick peas a few months ago and are always looking for ways to use them so we won’t get tired of them. I have a mild allergy to carrots so I’m going to try this next week with zucchini. I will post an update! This recipe is amazing. I’m not a huge fan of carrots, but I decided to try this recipe, carrot noodles included. I was wonderfully surprised at how well the carrot noodles went with the breaded chickpeas and bolognese sauce. The chickpeas by themselves are also really good and could be used as a topping for salads or added to any number of other dishes. Overall, this is the perfect, healthly comfort food for any day. made this last night and it turned out delicious, definitely making again very soon! This meal was absolutely amazing. It is my favorite vegan veg meal of all time. Another winner, Dana! This came out so yum! Will definitely make again. I skipped the panko to keep it GF and it still came out with plenty of crunch factor. Made this last night and it was the bomb! Doubled the chickpeas because I currently have 6 cans in my cupboard. LifeProTip for the carrots: lie them on your cutting board for more efficient shaving. I tried holding them over the bowl for the first 5 carrots, and they get break-y. Thanks for another great recipe, Dana! I made this tonight and it was AMAZING!!!!!! never made carrot noodles before but it was great. Delicious and filling! I don’t know if I found the carrot noodles personally worth the effort, but they certainly worked well. This is delish! I added some spicy sun dried tomatoes to the vegan parm last l made it and that give this recipe an extra kick. Used Spiralized zucchini instead of carrots. Easy to make too! I made this veggie friends while on holiday with them, and even their rather discerning (fussy…;o)) don loved it! If doubled, it makes a huge amount…happy fridge and freezer! You, are a genius!! Instead of the carrot “pasta” I’ll probably use spaghetti squash, but the chickpeas…I’m drooling! Hope you love it, Aleksandra! I could live off this recipe for years. The chickpeas are delicious as well as the sauce. The carrots add a healthy alternative to noodles and everything together is perfect for a delicious spaghetti alternative! This was so good and easy to make! I tweaked the sauce slightly based on what I had on hand, but the carrot noodles are genius and the chickpeas so delicious. Your recipes remain amongst my favorites! Thank you for your creativity and for keeping us, your readers, healthy and happy!! So kind! Glad you enjoyed it. Thanks, Emily! I made this for supper tonight and it was SO good!! My husband and I are both stuffed. Surprisingly filling, indeed!! Thank you for consistently rocking our tummies worlds! Made this tonight for a girls’ night and it came out fantastic! I was too lazy to do the carrot noodles but will try that next tine. We both loved it and I’ll definitely make it again! Looking forward to trying more of your recipes as I transition to a more plant-based diet. Thanks! This is so dreamy! I made this with spaghetti squash instead and I’m obsessed, definitely going to be making this a lot in the fall/winter! This looks like an amazing recipe wow! Great site I am new to it! I am just learning about chick peas – but I have dried chick peas – how do I cook a dried chick pea or should I be tossing for canned instead? Just made this for dinner…soooo good and so easy! My husband and I were totally amazed at how good the carrot noodles work. You are a genius! Thank You! 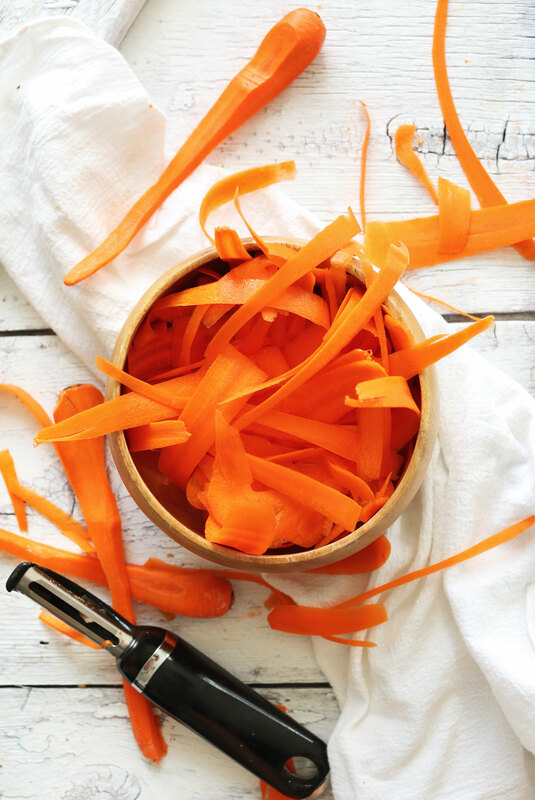 Can’t believe there’s no gluten in this recipe–loving the carrot noodles idea! How yummy does this look!! OMGGG!! So yummy and super filling! Will be making this again for sure! No need to! I had this over linguini this week and it was AMAZING! Thanks Becca! Let me know how it goes! Everyone’s always talking about zoodles, which I still haven’t tried due to lack of a “zoodle machine”. But hey, I have a vegetable peeler! I’m definitely going to try carrot noodles. I actually can’t believe I hadn’t already heard of this (carrot noodles) before. Oh, it’s so easy! I’ve been doing it a lot lately, and it yields a perfectly tender veggie noodle, no special equipment required! Let me know how it goes, Ashley. Oh my god Dana, this is sheer genius! I’m in love with chickpeas at the moment too! The best part of it all is that I’ve got those ingredients right now, I’ll definitely be doing this for dinner. Would you say a meat eater (boyfriend) can like this? Totally! I think a meat-eater would LOVE this. Let me know how it goes! I love all the ingredients that goes in it so I’ll be making that very soon! What is in canned tomato sauce? In the UK we cook more from ingredients and avoid factory produced products. What would you do to replace the canned item? Just a basic tomato sauce? I love this idea! Chickpeas is my favorite ingredient these days. I will try your recipe and I will let you know. Question- What flavor the roasted chickpeas will add to the dish? It makes them not mushy, and gives them a garlic flavor! Saw this in my inbox and had to make it! I love that it’s all easy ingredients and things I already have in my cabinet and fridge. It’s very yummy! The sauce and chickpea “crust” were amazing together! Thank you for sharing. This looks totally amazing and so easy! Chickpeas are honestly a miracle food! I definitely want to try this with potato noodles or turnip noodles (if you haven’t tried turnip noodles yet, DO IT! I use my Inspiralizer and boil them, and the bitterness cooks away and they are eerily similar to wheat noodles). I love pasta but lately the carbo loading makes me feel heavy and sluggish. 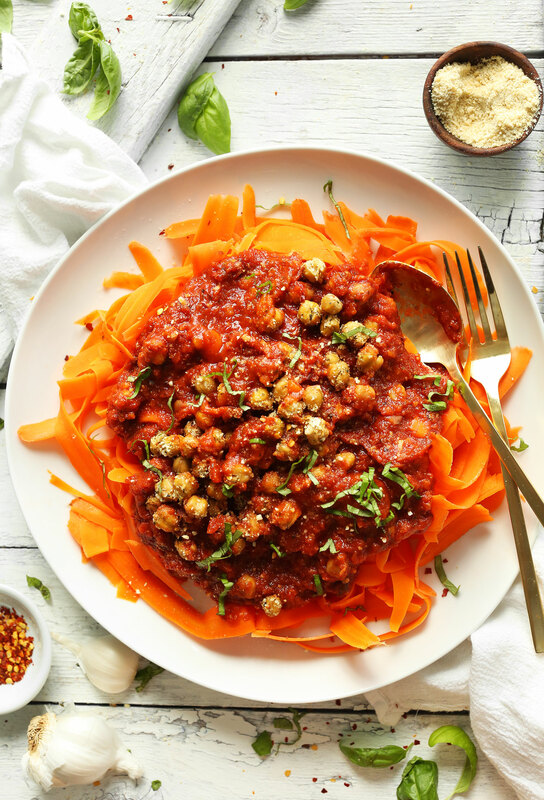 These carrot noodles topped with chickpea tomato sauce sounds light, filling and refreshing. Yay! Let me know if you give it a try! This is my kind of food! I’ve been craving carrot noodles lately, and now I have an excellent reason to hop to it. I love that you used crispy baked chickpeas, too! This sounds so heavenly. Must try! Yum! 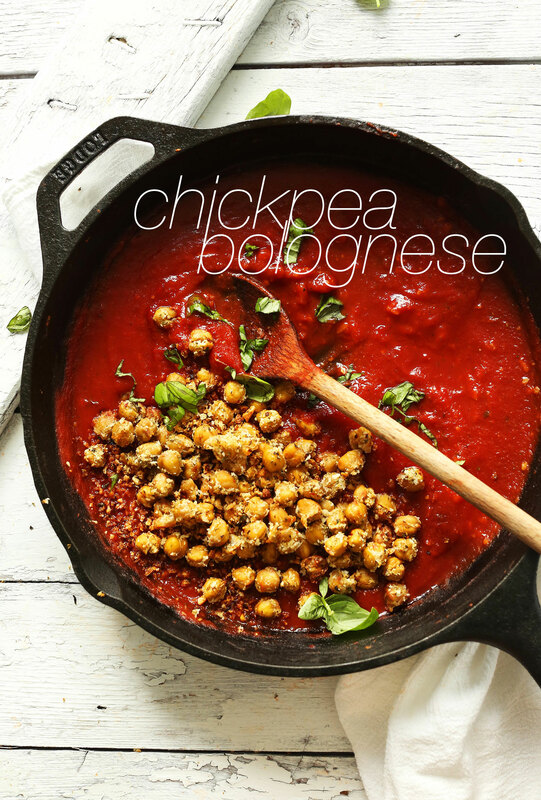 I love all your creative ways to use chickpeas! I am harvesting my last carrot crop now and am looking for yummy new ways to use carrots! Thanks!!!! I’m so with you Dana! Like 1000% (if that’s even possible..) this is just the recipe I needed and just in time for dinner preparations – the chickpeas are already in the oven and that sauce is just what the doctor ordered ;-) I just couldn’t help myself and had to taste a tiny spoonful and now I’m so ready to dig into a comforting dinner plate! Yay! Hope you loved it, Sabrina! Thank you again for another Fantabulous Recipe! Did you secretly read my mind last night when I said, “Self I have a taste for some really Great Pasta Sauce? !” Voila! Your recipe arrives! The Carrot Ribbon Pasta Noodles are a weekly staple for me with Spinach Pesto. “Boring!” Your Creative Splendiferous idea of Chickpea Bolognese has sent my Taste buds and Tummy into a Tantalising Whirlwind! You deserve 10 Stars with this one Girlfriend! You are The Queen of Creative Fantabulous Recipes for The Tasty Tummy! Took the words right out of my drooling mouth!! Ah, thanks so much! Glad you enjoyed this one! Thanks for sharing! What a great reacipe. I love that the chickpeas are breaded and crunchy, gives another dimension to the sauce. It sounds delicious. I have some spahgetti squash at home and this will be perfect to add on top. Love the idea of using carrots as noodles! I’ve never even thought to do that! Also roasted chickpeas are so yummy! Don’t waste that chick pea brine! Keep it and use it as an egg replacer!